I have heard of dental implants and I’ve heard of dentures, but what are implant dentures? I’m losing quite a bit of teeth because of a car accident. I don’t think I can afford dental implants but I’m too young for dentures (26). So is this a midway thing? I’m very sorry about your accident and that you’ve been put in the position of replacing your teeth. If you’re losing most of your teeth, then implant overdentures are a great option for you. 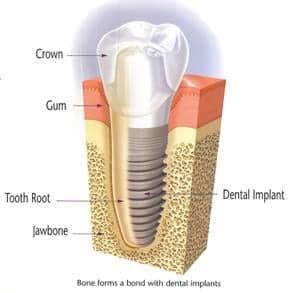 They give you the benefit of dental implants without having to get an implant for each missing tooth, which can cost a small fortune depending on how many teeth you’ve lost. Obviously, the more implants the better, but you can start with what you’re able. Without dental implants, you risk facial collapse. Look at the picture above with the woman. It shows what will happen to your face when you’ve had dentures for 10-20 years. You’ll still be a young pup by then but will look years older. This one has rather serious implications for your health. You won’t have enough jawbone left to retain your denture. This will make them impossible to wear, also making it impossible for you to eat. When it comes to your smile, you don’t want to mess around. False teeth can be made to look absolutely stunning, but they must be done by a skilled, artistic cosmetic dentist. To ensure that, I’d suggest you go to the mynewsmile.com website. When dentists ask to be listed on their site, they check out their technical skill, training, and artistry. If they’re not up to snuff, they won’t get listed. I have a question about traveling for dental implants. I’m not referring to tourism dentistry, which I know is dangerous, but rather within the United States. There aren’t any great options for dentists who do dental implants in my area. Most of them don’t have a very high success rate. I’ve done some research and there’s a dentist in my sister’s area who’s an extraordinary dentist, both in cosmetics and dental implants. According to my research, people travel from all over the world to get their work done by him. Is it safe for me to travel just to another state for dental implants? I know there’s always a possibility there can be complications so I didn’t know if that would affect my plans. What’s your opinion? I’m glad you know not to take part in the dental tourism rage. I know people think they’re saving money, but in reality, they’re putting themselves in danger. There aren’t any safety measures in most of those countries the way we have here. There are reduced standards in sterilization and quality. In some of the countries, like Mexico, sterilization is completely up to the dentist. In other cases, there’s no recourse if things go awry. Again, it’s completely up to the dentist if he wants to fix anything or just leave you in a mess. Many of those dentists will just pack up and move to another location if they get too many complaints. What you’re planning, though, is completely safe, as long as you take a few preparatory precautions. It seems like you’ve already done this, but I’ll expound on it for the sake of others who may be reading. You want to be certain the dentist has a good track record with the dental implant procedure. Look at their reviews. Check with the dental board and the Better Business Bureau, and look at photos of the dentist’s work in order to be sure you like the way the implant crown will look and you’ll be happy with your smile. Another thing to ask about is how many procedures they’ve done. Studies indicate that the more dental implants they perform, the higher the success rate they have. No dentist worth his or her salt should mind any of these questions. Because you’re going to be returning home, you want to have a plan in case you something goes awry. A dentist can do everything correctly and some bodies just reject the implant. Know ahead of time if you’re having trouble whether he will want you to come back for a visit immediately or he’d be willing to do a phone consultation first to see what steps you need to take. Altogether, the dental implant procedure should take about a year. You’ll have to make several visits. If you plan carefully with the dentist, he or she should be able to consolidate some of these visits or time them in a way to make them as easy on you as possible. You mentioned you’re going to your sister’s area. Ideally, you should stay with her for a little bit after the implant surgery to have a safe place to heal. This blog is brought to you by Naperville Dentist Dr. David Newkirk. Check out his smile gallery.